Appellate court decisions do not get much MSM coverage. 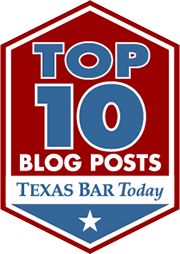 As a public service I will try and break down recent Texas appellate court cases for the non attorney. (This process is made much easier by TCDLA SDR report). I’m often hard on appellate courts for making decisions I disagree with. However, I want to start this section with some great appellate decisions. Facts- Cop searches defendants car for weapons. Cop has no warrant or probable cause. Cop sights ubiquitous officer safety (OS) justification. Cop let defendant re enter car, after Cop had removed defendant from car. Holding- Search is illegal. OS is a legitimate reason to search for weapons. However, there has to a real concern for OS. Cop wouldn’t have let defendant get back in a car if Cop thought defendant had a weapon in car. I say- “Officer safety” is appearing in more and more police reports. Word has spread of among law enforcement that claiming OS will justify almost any search for weapons (drugs). I’m glad to see the court recognizing that OS is being abused to search for dope. Facts- Defendant went along with Friend to a buy meth. Defendant helped Friend contact meth dealer. Defendant knew Friend was buying meth, and knew met was present at meth dealer’s house. Defendant doesn’t touch or buy any meth. Defendant is charged with possession of meth. Holding-Knowing and/or helping with a drug deal does not make one guilty of possession. The right charge would have been delivery. Being guilty of delivery does not make one guilty of possession. I say- It’s great to see the court reject a drug conviction. It is not too much to require the state charge the right crime. Besides, we already have thousands of meth people in jail already. Way to go Austin! Facts- Defendant had $30,000 in trunk. Police arrest Defendant for money laundering because he has a lot of cash. There is NO evidence that the money was proceeds from illegal activity. Holding-Convinction overturned. Without any evidence of illegal activity there can not be any money laundering. I say- Another great ruling! Because of the War on Drugs many police treat large sums of cash as contraband. It is great to see the court recognize that transporting money, even a lot of money, does not make one a criminal. Facts- Defendant is indicted for Indecency. ELEVEN years later, Defendant learns of charges and turns himself in. Holding- Defendants speedy trial rights were violated. I say- Old cases are hard to prosecute. Indecency charges are hard to defend. In this case the court recognized that it is impossible to have a fair trial on such a charge after more than a decade has passed since indictment. I say- I have nothing to add. These are decisions Texans can feel good about (except maybe the last one). Texas courts have made the criminal justice system better by getting rid of bad convictions. Decisions like these keep us all safe by protecting the innocent and holding the government to a higher standard. Well done. Ever see the movie “Saved”? The last case reminds me of a line from it. Hilary Faye: Mary, turn away from Satan. Jesus, he loves you. Mary: You don’t know the first thing about love. Hilary Faye: [throws a Bible at Mary] I am FILLED with Christ’s love! You are just jealous of my success in the Lord. Mary: [Mary holds up the Bible] This is not a weapon! You idiot. Other than the last case, it looks like a good round of decisions by the Appeals courts.